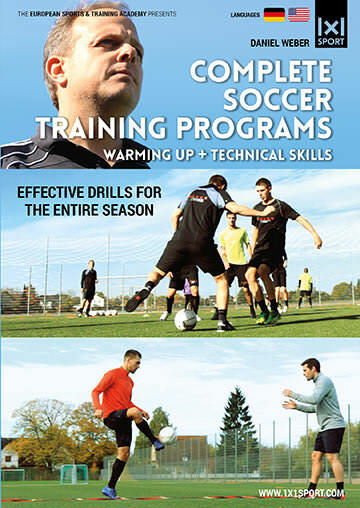 Coordination and concentration are two very important skills for soccer players. This is why we’re about to show you a unique drill combining basketball and soccer skills. To start off, let the players move around dribbling one ball with their hands and one with their feet. Tell them to use their weak sides as well. After that, you can play a game. Each player still has to dribble one ball with their hands. But now there are only two soccer balls involved for „regular soccer purposes“. These two balls are being passed from one player to another while running around and still dribbling their ball with their hands. You can make things even more interesting by playing a regular game of soccer, while the players still use their „basketballs“.